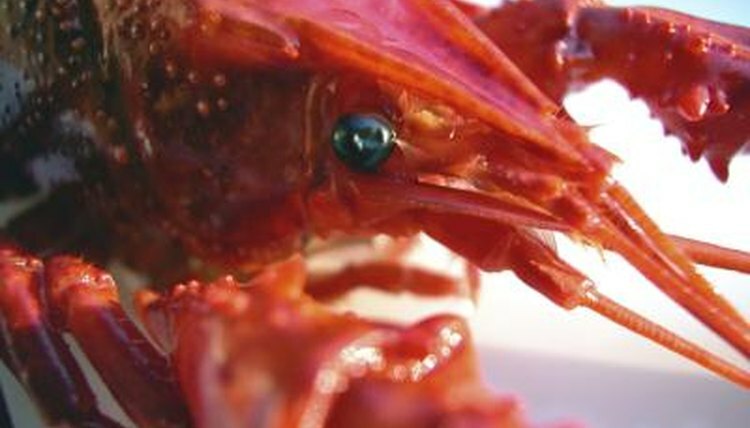 Crawdads -- also known as crawfish, crayfish and mudbugs -- are nocturnal arthropods, crustaceans similar to lobsters. While typically considered a delicacy, they're also suitable as aquarium pets. Catch one in the creek, or purchase one from a pet store. Care for him as you would other crustaceans, and he might live 20 years. Your crawdad needs a large tank -- one of at least 10 gallons -- with an escape-proof lid, and gravel on the bottom. He may move the substrate around into mounds to protect himself from perceived predators. Place several larger stones on the bottom, as well as an aquarium "house," for hiding spots. The water must be deep enough to cover the crawdad; provide a branch or larger rock that he may use to perch out of the water. Keep the pH of the water at 7, which is considered neutral. Boil a few empty eggshells and drop them in each week; they'll keep the water balanced, and your crawdad will enjoy snacking on them. One crawdad per tank is recommended; someone will end up eaten if other crawdads or fish are in the tank. Feed your crawdad a varied diet. You can drop in large fish flakes twice a day, and yo can include bloodworms, small canned shrimp or small bites of bait minnow once a day. Or drop in large fish flakes twice a day. Give small pieces of carrot or potato as a treat. Do not be concerned with dropping the food near his hiding spot; your crawdad will smell the food and come out of hiding on his own. Pick your crawdad up on the sides behind his head, holding him between your thumb and forefinger. This technique avoids his large, powerful front claws, which he'll use to pinch when threatened. If he latches on, immediately submerge him in his tank where he feels comfortable; he should happily let go. To avoid disease and health problems, keep your crawdad's tank clean. A simple aquarium pump will filter out impurities and aerate the water. Nevertheless, switch out 10 percent to 15 percent of the water each week. If your discover your crawdad has shed his skin, don't take it out in an effort to clean. He will actually eat it within a few days himself for the minerals it contains. Any limbs lost may regrow during molting, so don't be surprised if a missing leg reappears later. If he becomes ill, prepare yourself -- crawdads typically succumb to illness. Arizona Game and Fish Department: Crayfish -- Ugh and Yum! What Is Compatible With a Clown Trigger?